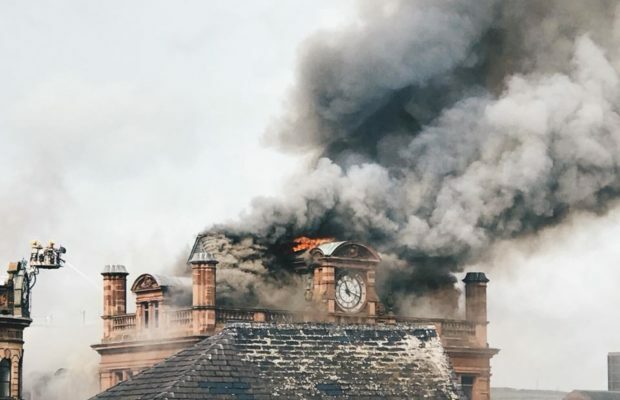 The iconic Bank Buildings, housing one of Belfast’s busiest high-street retailers, Primark, has seen a devastating fire destroy the listed building. This incident, however, could affect more than just the discount giant’s retail future in the city centre. 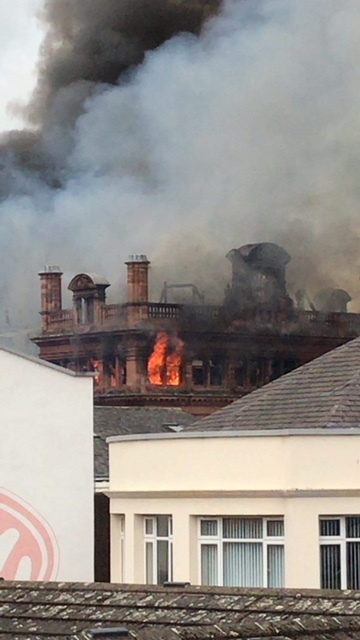 The fire that distraught one of Belfast’s busiest high-street retailers, Primark, has now been put out, and we can now see what the real damage is. 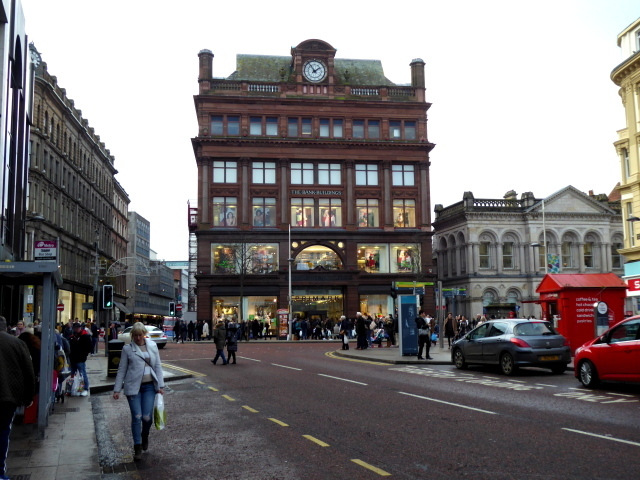 Whilst the destruction has caused irrefutable damage to the store, retailers around the Royal Avenue area of Belfast could expect to see a slump in footfall for the coming weeks. This has been a devastating chapter in the long-life of the Belfast landmark, which was close to completing a £30m refurbishment. Thankfully all staff and customers were evacuated, although no cause of the fire has been released by emergency service. We can expect a long investigation into the cause. 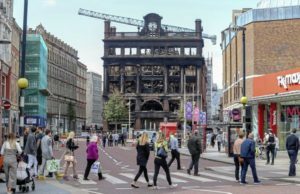 Commenting on the Primark store fire in Belfast City Centre, Retail NI Chief Executive Glyn Roberts praised the heroics of the fire services, and was thankful that nobody was injured. A testament to the professionalism and aptitude of the fire services involved within the retail disaster. Glyn went on to tout concern for the city centre and the overall affect this could have on retail: “This is very concerning development, both for Primark and the city centre as a whole. Glyn went on to wish everyone involved with the store his sympathies and that he hoped it would open again in the future. 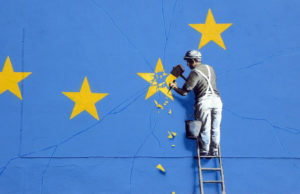 The current climate for retailers, with a non-functional and Brexit looming around the corner is already one of uncertainty for the industry. The events that took place at the Primark store could mean further disruptions to other retailers within the area. Speaking to Neighbourhood Retailer Aodhán Connolly, Northern Ireland Retail Consortium director agreed that this incident could see a change in consumer behaviour. Like others involved within the retail sector Aodhán thanked the fire service for putting themselves on the front line and was thankful that nobody was injured in the blaze. He did also note that, “there will be a seismic shift in footfall for all the retailers who share a symbiotic footfall relationship with Primark. It is clear to see that this incident is going to have a negative effect on retailers close to the building for, currently an untold length of time. Mourne Seafood Bar and Kelly’s Cellars, two iconic Belfast city centre food and drink retailers could face weeks of dormancy due to the close proximity of their establishments to the burnt building. Primark chief executive, Paul Marchant, commented that he was deeply sadden and that, “The safety and wellbeing of our customers, colleagues and construction team is of course the most important consideration and we are truly relieved that all were evacuated safely. The president of Belfast Chamber of Trade and Commerce, Rajesh Rana, who too attended today’s Belfast’s City Hall meeting explained the focus is now on how we can help. The purpose of the Business recovery Group is to provide information, support and assistance to traders and affected by the Primark fire. Rajesh continued advising that, “Building Control is that the safety cordon will be reduced today to a zone approximately 45m of around Bank Buildings. 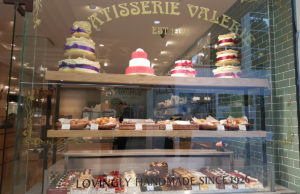 “Belfast Chamber is working to collate a list of alternative vacant premises in the city that traders can relocate to on a temporary basis. 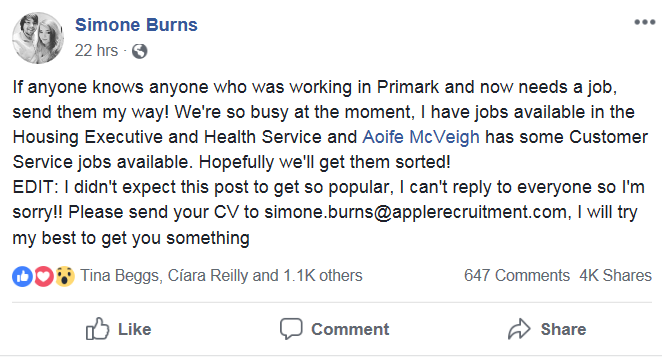 This is an overwhelming lose for the Belfast retail commerce; however, support from people like Simon Burns, who posted on Facebook that Apple Recruitment are currently so busy, and has shown the good nature of some people in helping the retailer. Simon explained they currently have jobs available in the Housing Executive and Health Service and some Customer Service jobs available for any of the 100 staff that could potentially be affected by the fire. 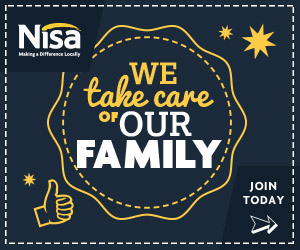 The heart warming gesture from Simon Burns to help staff affected by the retailer fire. Whilst this is a big blow for the retail commerce in the city centre of Belfast, with a hit expected to be taken by retailers in the surrounding area. Many can appreciate the sincerity of people involved with trying to make the best out of a bad situation and bring life to retail in Belfast.